„Dirndl“ and „Lederhosen“ are traditional costumes that evolved from the traditional clothing of the bavarian rural population. Our selection includes historical, festive historical costumes as well as a variety of simpler ones in all sizes and plus sizes. With us, you won’t only find the fitting clothes but also expert advice leaving no questions unanswered and nothing to be desired. Of course we can also outfit larger groups of 5-400 people. For more information see (LINK). 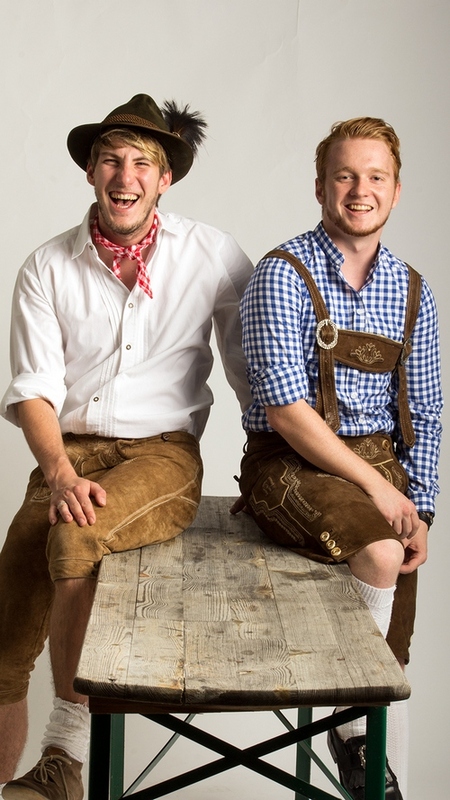 Our high quality, traditional „Lederhosen“ are available in different lengths and made from real leather. We offer them in light brown, brown, dark brown, green, black and red for men and women. Also available are matching braces, matching „Haferlschuhe“ (traditional brogues) of leather in various colours and sizes, various traditional hats with or without „Gamsbart“ (ornamental hat feather), „Trachtenjanker“ (traditional jackets made of lambs wool), cardigans, traditional shirts ranging from white to plaid and also traditional stockings and „Loferln“ (traditional bavarian socks that come in two pieces. One up to the ankle, the other one covering the calf). From traditional to modern, from simple cotton to festive silk, we make any wish come true. We can manufacture individual one-of-a-kind items, made-to-measure or supply several identical „Dirndl“ for large groups, even antique originals are part of our collection. A large range of matching hats with or without feather, „Trachtenjanker“ (traditional jackets made of lambs wool), cardigans, traditional chokers, jewellery, bags, shoes and stockings are also available.